George Marvin : Riding the Surf at Waikiki. 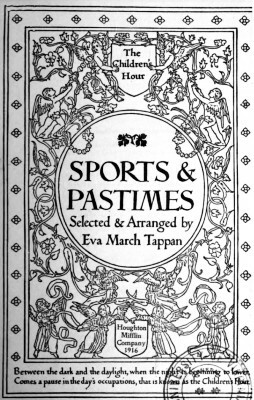 Selected and arranged by Eva March Tappan. Houghton Mifflin, Boston, , 1916. The story (as noted on page vi) was originally published in Outing by the Outing Publishing Company, the date unidentified. Outing Publishing Company, New York, Chicago, Volume 64 Number1 April 1914. "The first edition of the Children's hour is limited to 1000 numbered copies, of which this is no. 382." 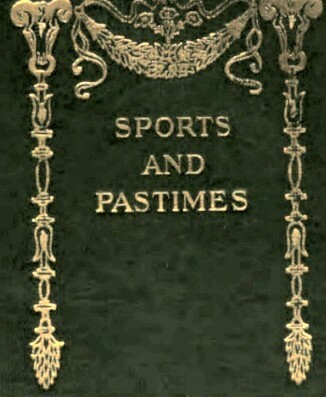 Published in fifteen volumes, each volume has special title page. "See, they 're goin' to ride the big surf this mornin'." Sure enough Kahola, grabbing up his big board, joins Paoa, and the two together, moving still farther away to the left, slosh out through the shallows. "Yes, surely the two best here at Waikiki — not counting yourself, Mak. islands, Niihau or Hawaii? Those wild stories of Hilo Bay?" "Every one says the best in the world are here," says Makaele, throwing handfuls of sand on his coppery legs. Your 'alaia' is not seven feet. Paoa's and mine less than six. reef, a mile or so offshore. From where we sit the whole sunny sweep of sparkling ocean seems the same, as from one wooded point to the other the long, onward-marching ridges reach clear across in even succession. But when you get into the water there is a whole lot of difference between the big surf where eastward a more abrupt shoal piles incoming waves up steep and strong and the serener cornucopia rollers where the bottom goes out almost flat for half a mile or so. She's got that pretty Mrs. Neave with her, who came in yesterday on the Tenyo Maru from 'Frisco, "just crazy to try surfboard riding," as she calls it. Some chiefs, those, as the pretty Mrs. Neave would say — and their Homeric surfing on twenty-five foot boards that no modern man could lift. Punctuating Makaele's monologue come the shouts of the laughing. Kanaka boys, beginning now to paddle out together toward the reef; from time to time I can hear the drone of the Honolulu trolley car with its changing note as it hits the bridge back of ex-Queen Liliuokalani's house. darker blue of the deep Pacific beyond the reef where the white sails of fishing boats are heaving. "There they are," says Makaele, suddenly breaking off in the maritime amours of Kalea and Kalamakua; and summoned out of our sun-baked laziness by Linda's familiar whistle, we are off down the beach to meet two graceful figures drifting in long white bath wraps to the sea. chance of our upsetting out on the reef or turning turtle coming in, and then where should you be, Mrs. Propriety, with an old skirt wrapped round your legs?" The two girls splash laughing up to the outrigger. Linda and the two Kanakas start paddling easily out in the soapy water. The pretty Mrs. Neave, watching Makaele, forgets all about her bathing suit. Flat on his chest, his legs churning the water in the trudgeon stroke, he keeps both arms going like paddle wheels each side, the front end of his alaia scowing over the water like the bow of a launch. I'm doing the same thing, but only two or three others can make such speed as Makaele, even when he is n't showing off. This matter of navigating out with your board is an important part of surfing, and good fun, too. At first you think you are going to wear your short ribs right through the skin from the chafing of your position on the hard "koa" wood, and for the first week of your malihiniship you contract pains like inflammatory rheumatism in your shoulders, the back of your neck, and the small of your back. Consequently you often have long distances where you can make speed going out; sometimes, depending on the tide and wind, the sea all about you will be like a plain; then, especially half a mile or more from shore, where most riders turn, the surf will come in series, three or four, or even seven, crests at a time, rolling in very grandly in a sea procession. On the reverse slope, looking back, we see the outrigger lift drunkenly over the white ridge and come down, ke-slosh! ke-zop! — Linda a victorious figurehead in the bow. In negotiating these big toppling fellows you must be careful to duck the front of your board just right as you dive through, otherwise she is apt to plumb the depths without you or set you back shoreward with a big drink of salt water. Now comes a level space, and way ahead of us we make out the dark heads and shoulders of the Kanaka boys sitting on their boards waiting for a good wave. We hear them calling to each other excitedly "Nalu-nui!" (big wave) and "Hoe, hoe, hoe" (paddle, paddle, paddle); then with a shout the row of dusky figures out at sea leap upright on their boards and come tearing in. and these two men are the pick of their race. Without changing a line, you could put them into a Greek frieze, but you would have to animate or electrify the frieze to keep it in key with their poised grace supreme in this immemorial pastime of their people. A familiar sight, it is nevertheless a miracle, for the boards are nearly hidden in spray so that we behold shooting down at us two youthful Tritons, not, as they really are, obeying the course of the wave they ride, but directing it; ruling, triumphing over the ocean. "A-i-i-i-i-e-e-e-e-!" yells the duke, as he goes streaming by, light as the spray smoking after him, the last of his yell swallowed by the half-drowned work I make of that breaker because of watching him too long. It is still a long hoe out to the reef, and Mak and I, already half a mile offshore, decide to mark time here-abouts, the outrigger going on to the "kulana nalu," place where the surf begins to form, so as to give our now highly enthusiastic gallery a longer ride in. Off to the eastward old Diamond Head, couchant like ourselves, stretches out into blue water, the iron pyrites at its base shimmering like myriads of real diamonds. Millions more of sparkling water diamonds the sun makes far westward over the sea to the purple headland of Waianae. We have not long to wait before we hear a distant hail from the sea and, looking back over our shoulders from the top of the next low swell that heaves us up, we make out a fine series of surf charging toward us hot off the reef, the canoe chasing down the face of the first hill. Now it is all action with us, for to catch a wave just right you must get to going at top speed before it over-takes you. In spite of its threatening height it will peter out before it gets ashore and be absorbed by the following surf. You must let that kind, or double ones, go, and wait patiently for a precipice with a jagged edge toppling over you. foot. There is a brief dream of fair women, starry-eyed,their mouths open and their arms outstretched, and back on the wind comes a Gabriel-horn kind of noise, the result of Linda's contralto jeer at us mingling with her friend's high soprano shriek of delight. Anyone who has sailed a racing canoe in a fresh breeze, or held the tiller of a sloop, running free in a heavy following sea, will have some idea of the sensation of surfing. sensations by at least ten to get the exhilaration of riding a big surf at Waikiki. The lift and yawning thrust of the wave under you is something like that you feel in a boat, but a twenty-pound board is, of course, far more sensitive. to hurl you like a javelin at the beach. As a racing canoe is balanced on a rigger out to wind-ward, so we, standing upright on our racing boards, balance them by anticipating the whim of the wave, keeping them coasting forever down hill and never reaching the valley. The danger point ahead is in driving the alaia nose under, when she is very sure to throw you and dive for coral; yet I must not let her climb too high or I shall lose the wave and be dragged backwards over the crest as though someone had suddenly tied a flock of peach baskets on behind. Sunlight and flashing color! A great wash of air and water; tingling life and speed, speed! We are chiefs of old, back in the springtime of the world, in the undiscovered Pacific! Makaele, in sheer exuberance, stands on his head on his board and goes on so, his legs in the air like the spars of a derelict. "I'm going to learn to do that," says the extraordinarily pretty Mrs. Neave, "if I have to stay here a year." Geoff Cater (2016) : George Marvin : Riding the Surf at Waikiki, 1916.